Somewhere, high in the hills of Grit City, there lives a mild-mannered shopkeep by the name of Michael Fitzgerald. This unassuming entrepreneur, at first glance, may not bear any distinguishing marks or remarkable characteristics (winning smile notwithstanding), however, follow him from the local coffee shop to the door of his storefront and, as he clears the threshold of his entryway, it is clear that there is more to Mr. Fitzgerald than meets the eye. Like so many young men and women, Michael grew up with an appreciation for comic books. Unlike most fans and geek-culture enthusiasts, however, Michael has made graphic novels and comics his business. Literally. His origin story is not unlike the beginnings of other mild-mannered alter egos which readers might recognize. Like Clark Kent and Peter Parker before him, Michael sought creative outlets for his thirst for justice. After moving to Tacoma from a suburb of Detroit, Mike studied media, arts and culture at the University of Washington’s Tacoma campus. He thought that he might hang a shingle as a copy writer here in the South Sound. The creative writer and sometimes-artist had always fostered a love for graphic novels and comics, working at a comic book shop in high school and interning with Wizard Magazineand Fantagraphics through college. It wasn’t until he fell in league with Spaceworks that Michael’s destiny became clear. Spaceworks is a joint venture of City of Tacoma and the Tacoma-Pierce County Chamber of Commerce. The program was created to activate the empty storefronts and vacant spaces in Tacoma with art and creative enterprise. Tinkertopia’s R.R. Anderson and his wife, Darcy, proud owners of a craft supply store with an upcycled twist, are just one of the dozens of enterprises that have found a home thanks to this advocacy program. When Anderson (a comic book artist himself) reached out to Michael about the upcoming deadline for Spaceworks, this began a chain reaction that would ultimately lead to the establishment of Destiny City Comics as we know it. While Spaceworks may have played a huge role in revving up this young graduate’s engine, the work of finding the perfect headquarters fell to Michael. He says he always knew that the Gritty City was going to be his base of operations. “Tacoma is a great community that is accessible and central, thanks to amenities like the light-rail. It never even crossed my mind to find a space anywhere else. I had had my eye on the spot next to King’s Books for some time, and I was so excited to get that location.” This spot is not only central to the Stadium District, but it also places the comic book haven directly in the nexus of all things indie, rare, and original — all hallmarks of geekery and nerdishness. Destiny City comics takes inspiration from its aforementioned neighbor, King’s Books, not only in location, but also in that the comic book store makes an effort to put exciting eventson its calendar. A champion of the local, Michael situates freelance comics, independent artists and illustrators front-and-center. The shop promotes artwork and activities from Washington’s one-and-only coalition of cartoonists, the Cartoonist League of Absurd Washingtonians. 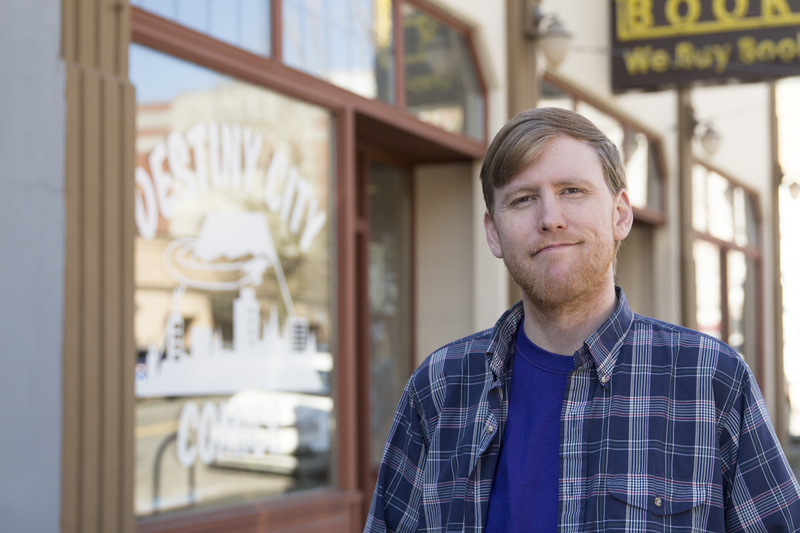 Destiny also represents the Pacific Northwest with offerings from the likes of Seattle-based Intruder Comics. These newspaper-style surreal comics are the collaborative work of several artists, and the latest issue is always free at the store. 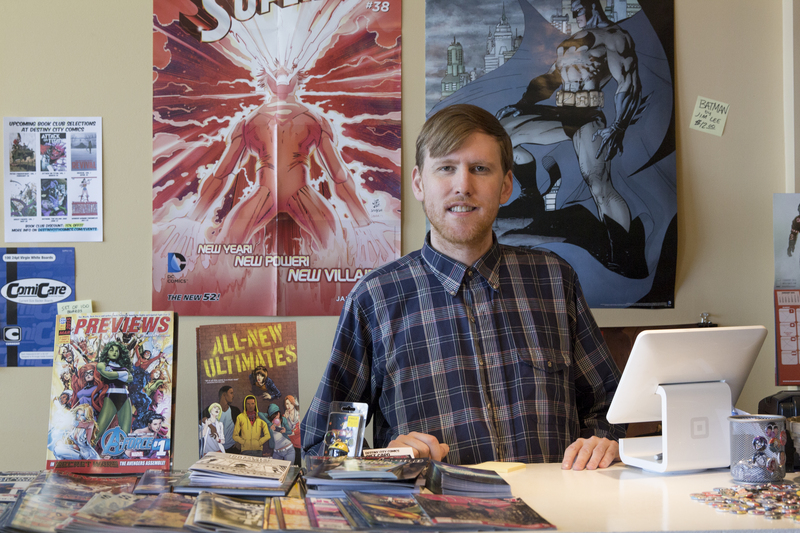 For those curious, would-be comic book lovers who have as-of-yet to channel their inner geek, Destiny’s Michael Fitzgerald is using his tremendous powers of communication and boundless enthusiasm for good. “I get a lot of customers who want to check the place out,” says Michael, “but who are admittedly out of the loop when it comes to comics. I love helping customers find a title that’s right for them. I usually direct them to a bestseller like ‘Saga’ or really anything from Image Comics.There are events for comic book aficionados who want to dig their heels in and talk shop, such as a book club that meets monthly. “We try to have interesting picks for the book club,” says Michael, “like this past month was ‘Wonder Woman Chronicles, Volume 1.’ This features the original appearances of the classic character by her original creator, William Moulton Marston. They’re really bonkers tales from the Golden Age of comics, and the author was featured in a recently popular book ‘Secret History of Wonder Woman.’ Although comics fans were only fairly aware of his interesting life, he was in a polygamist relationship and also invented the polygraph, which kind of makes the whole lasso of truth thing more interesting.” Interesting, indeed. Mike also offers a subscription service and membership program, which can add up to deep discounts and beaucoup savings. Mike says that now is a good time to dip a toe into the ultra-inclusive but mysterious realm of comics and graphic novels. This is because Destiny Comics, along with thousands of other independent comic book stores and chains around the world, will be participating in Free Comic Book Day on May 2, 2015. 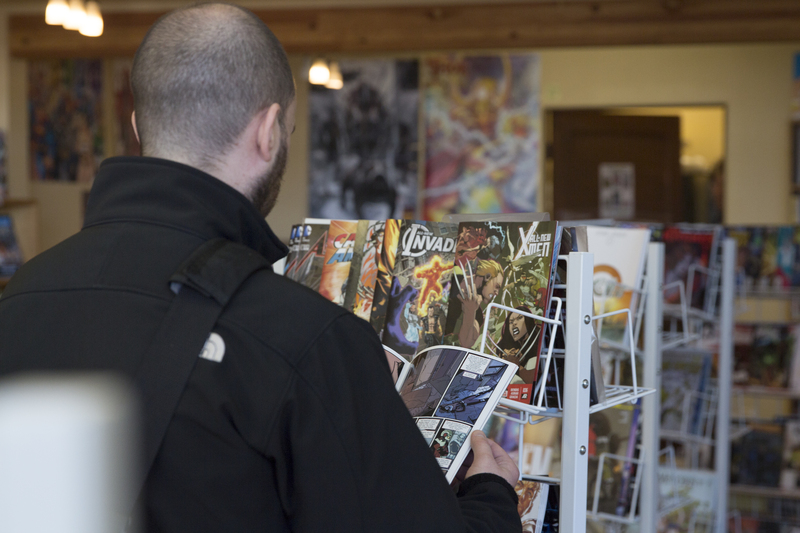 This tradition took flight in May 2001; ever since that fateful first gathering, participating comic book store owners have been offering a selection of free comic books to anyone that visits their store during the first Saturday in May. This event is a great opportunity to patronize a local small business, learn more about comics, and get your geek on. Today, Mike and his trusty sidekick — a well-read attack cat — spend their days fighting crime from behind the counter. The duo is tireless and unwavering in their mission to advance the work of local, up-and-coming, and famous artists alike. There are a handful of events coming in 2015 that Michael is excited to be a part of; chief among them is the inaugural Destiny City Queer Con. Tacoma’s Pride Festival will be held July 11, 2015. On this day, the comic book shop will the host to some fantastic guests. This story originally appeared on South Sound Talk on May 1, 2015, and can be read here. This entry was posted in Uncategorized and tagged 2015, Destiny Comics, Free Comic Book Day, geek, May 2nd, Michael Fitzgerald, nerdcore, Spaceworks, Stadium District, Tacoma. Bookmark the permalink.